With all the fabulous red carpet looks and the excitement of the Oscars, you may have missed a very exciting commercial - the Joe Fresh for JCPenney commercial! I had no idea that Joe Fresh was developing a line for JCP. A simple Google search informed me that this retail partnership was announced last summer. I guess I have been living under a rock! In case you are not familiar, Joe Fresh is a brand by Canadian designer and founder of Club Monaco, Joe Mimram, and is known for its super cute and very budget-friendly pieces. I became familiar with Joe Fresh from following a couple of my favorite Canadian bloggers (shout outs to Stephanie at Inherited Jeans and Krystin at Suburban Faux-Pas). It drove me crazy that the brand was basically inaccessible to me, as there is no e-commerce and only six stores in the U.S. (all in the NYC area). I have not been to a JCP in years, but the company has done a lot since last summer to rebrand and revitalize its image. It has not gone unnoticed. I have seen the ads in magazines, and I have been meaning to check out the "new" store. This Joe Fresh collaboration is "it" for me. I think it is such a smart move for JCP. I have not followed how the rebranding has gone for the company so far, but the Joe Fresh combination of covetable, on-trend pieces at reasonable prices will certainly get me, and I am sure many others, in the store and shopping online. I am loving so much of this collection, especially the printed pants and shorts! So on-trend and so affordable! Most pieces appear to range from $19 to $29. The most expensive piece in my picks above is the lace skirt for $49. I cannot wait to check these items out in stores! I am going to be out of the country when the items hit the stores, so I may just have to order a couple of things online before then! So thrilled that I can finally have some Joe Fresh in my life! What do you think of the Joe Fresh for JCP collection? Have you been to JCP since its recent rebranding? Let me know in the comments below! Meghan, I am sooooo obsessed with Joe Fresh!! I think half my clothing is from there. So excited you'll have access to it now!! If you ever spot their leggings (they don't always carry them), BUY. Best leggings I ever had, until I spilled white paint all over them, haha. I'm still searching for Joe Fresh replacements! SO excited about Joe Fresh!! I will keep my eye out for those leggings, for sure!! Thanks, Kelly!! I will definitely try and convince him! I am going to try my hardest to get some out of him this weekend ;) Glad to hear your fiancé is enjoying it!! Yay! I guess I've been living under a rock too! I have been dying to try out Joe Fresh too. Love love this post! Yay!! Thanks, Elvy!! Make sure you post about what you buy!! So excited! Hi! 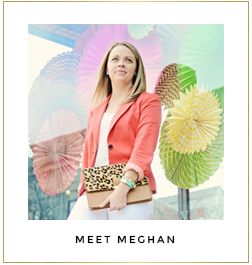 Meghan, I just found your blog and I love it. I was hoping we can follow each other on here and also IG, I think you're doing awesome with the blog. Thanks, Jaela! That means a lot. I am having so much fun with the blog, and I am so glad to hear you're loving it. I will pop over to your blog and find you on IG! I absolutely love your site! Great posts and I look forward to working with you too in the blogger group! your button is now up on my page too! I'm your newest follower and am looking forward to your upcoming posts! Thanks, Courtney! So excited that we are now connected!